Mario Ramirez, our I.T. 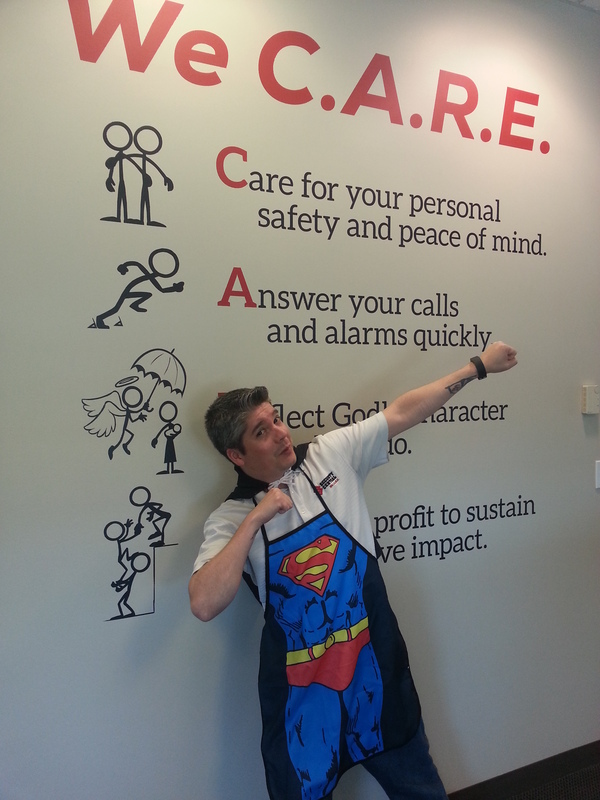 super-hero, is the latest recipient of our quarterly I-C.A.R.E. award that recognizes team members who go above and beyond to C.A.R.E. for our clients, our co-workers, and our community. In Mario’s case, he went to “Infinity and Beyond” in his heroic efforts this past quarter to solve a particularly challenging and perplexing problem we experienced with our AES radio communication network. The entire Security Central tech team did an amazing job of responding to and addressing the problem, but it was Super Mario’s creative genius and his ability to piece together a solution with the parts and pieces available that saved the world from doom, as all good super-heroes do. His efforts were a combination of MacGyver and Apollo 13 ground-control engineers as he used items from our warehouse and his treasure-trove of I.T. components to restore the network to normal operation and maintain the safety and security of our clients! Rather than bestowing the traditional Crown of C.A.R.E. upon him, we thought it would be more appropriate to outfit him with his very own super-hero costume, complete with the well-deserved “Superman” symbol and obligatory super-hero cape. If you need someone to save your day, Mario is your (super) man!